Kinda of beat up device, comes with the Nunchaku tank, coil, brand new 18650 battery and 4 types of ejuices. Device has some scratches and chipping. Not in the greatest condition. Comes with brand new 18650 battery from Dashvapes. 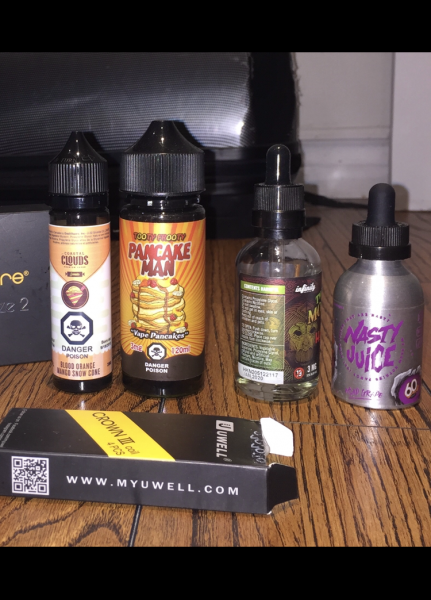 Comes with 4 types of ejuices (3mg nic) - Tooty Frooty Pancake Man (100ml/120ml) - Costal Clouds Blood Orange (40ml/60ml) - Nasty Juice Asap Grap (30ml / 60ml) - Twelve Monkeys Hakuna Matata (15ml / 60ml) Will toss in 3 Crown III coils for free. Contact me for shipping and we will work out the cheapest and safest shipping!